Your backyard needs a fire pit! Sitting around a fire isn't reserved for camping anymore - it can be in your own backyard! Invite friends and family over to roast hot dogs and marshmallows or just relax for a fireside chat. 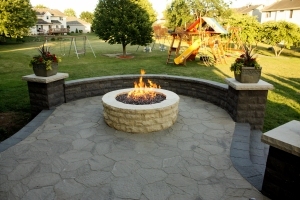 We can design and build a fire pit or outdoor fireplace that is right for your property. Beemer Landscaping understands that you want experience and reliability from start to finish. We will work with you to design the fire pit or outdoor fireplace that is right for your yard or patio. How close can an outdoor fireplace be to my house? Should I choose a fire pit or an outdoor fireplace? Would a pre-built or custom outdoor fireplace work best for me? Whether it is sunny or cloudy, summer or winter, a fire pit or outdoor fireplace can be a great venue for family bonding and a way to enhance the beauty of your property. Let Beemer Landscaping add allure to your lawn with the fire pit or outdoor fireplace that is right for you! We service the entire Central Iowa area so contact us for a free quote or fill out our Landscaping Project Questionnaire.